Jacksonville, FL — Muriel Wells, Digital Information Librarian for the National Children’s Advocacy Center’s Training Center, met with hundreds of child abuse professionals at the annual National Organization for Victim Assistance (NOVA) conference in Jacksonville, Florida. Muriel Wells provides conference attendees with CALiO demonstration. 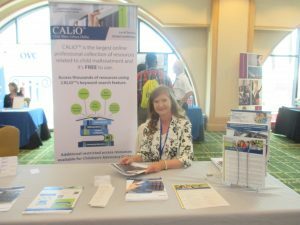 The NCAC exhibit offered attendees several resources and information about CALiO. 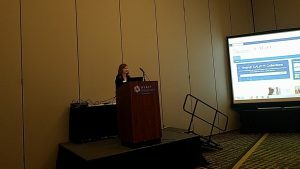 In addition to exhibiting at the conference, Wells also provided attendees with a live demonstration of the Child Abuse Library Online (CALiO). CALiO is the largest online professional collection, providing access to published knowledge, educational materials, and resources related to child maltreatment. This year’s NOVA Conference brought together close to 2000 victim advocates from across the United States and several countries. While exhibiting, Wells had the opportunity to share the Child Advocacy Center model with attendees.